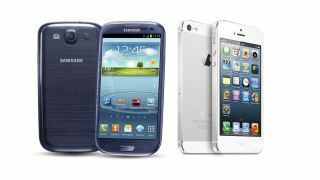 Samsung's line of Galaxy, Nexus and Transform devices infringe upon part of a key Apple parent, relating to the selection of text in iOS devices, a judge has ruled. In preliminary findings, the International Trade Commission judge said Samsung was in violation of the patent entitled "Method and apparatus for providing translucent images on a computer display." Specifically, the offence relates to the translucent bubble that appears over the top of text when it is selected by the user within the web browser and in other apps. The ruling was made on March 26 and only made public on Friday, but if the decision is upheld, the offending devices could face an import ban into the United States. The judge Thomas J. Pender also ruled that Samsung had not infringed on a patent which covers how the devices recognise a microphone plugged into the headphone jack. A final ruling is expected in August.